Background: Malaria is one of the major obstacles to the socioeconomic development of several developing countries. Adequate treatment of the disease is becoming increasingly difficult due to the worsening problems of drug resistance in many parts of the world. Therefore, increased efforts in antimalarial drug discovery are urgently needed. Objectives: This study was designed to evaluate the antimalarial activity of the leaf latex of Aloe citrina Carter and Brandham and its major constituent. Materials and Methods: The leaf latex of A. citrina was dissolved in methanol and subjected to preparative thin layer chromatography. Structure of the isolated compound was determined on the basis of its electrospray-ionization tandem mass spectrometry, 1 H, 13 C NMR and DEPT spectral data. The latex and its isolated compound were tested for their in vivo antimalarial activity using a 4-day suppressive test against chloroquine sensitive ANKA strain of Plasmodium berghei in mice. Results: Homonataloin A/B was isolated as a major component of the latex. Both the latex and isolated compound exhibited significant (P < 0.001) antimalarial activity at a dose of 400 mg/kg with parasite suppression of 60.59% and 67.52%, respectively. No significant adverse signs of toxicity were observed in mice treated with the leaf latex up to the highest dose (5000 mg/kg). Conclusion: The results of this study indicate that the antimalarial activity of the plant is attributed in part or in full to the presence of homonataloin A/B in the latex. It also validates the traditional use of the plant as an antimalarial agent. The ever-increasing resistance of malarial parasites to the commonly available antimalarial drugs has necessitated the search for new drugs. Traditionally used medicinal plants have played an important role in malaria treatment in most African countries including Ethiopia. Aloe citrina Carter and Brandham, locally known as "Hargissa," is one of the indigenous Aloe species of Ethiopia. It grows in an open deciduous Bushland, with pubescent and papillate flowers, prominently spotted leaves and the relatively long pedicels. People who live in and around Sof Omar caves in Bale Zone use leaves of the plant for the treatment of wounds, malaria, eye infections, and abdominal pain. In this context, our present work has focused on the isolation and structural characterization of an antimalarial compound from the leaf latex of A. citrina. The leaf latex of A. citrina was collected in December 2011 from Bale region, Sof Omar caves 110 km east of Bale Robe. The identity of the plant material was confirmed by Prof. Sebsebe Demissew, the National Herbarium, Department of Biology, Addis Ababa University (AAU) where voucher specimen (collection number: BG001) was deposited. NMR spectra were recorded on Bruker Avance DMX400 FT-NMR spectrometer operating at 400 MHz for 1 H and 100 MHz for 13 C at room temperature using MeOH-d 4. NMR signals were referred to internal standard, tetramethylsilane. Chemical shifts are reported in d units. Mass spectra (MS) were recorded on ultimate 3000 LC-MS. The measurement was carried out by an electrospray ionization (ESI) method with negative mode. The source voltage and temperature were fixed at 3 kV and 250°C. Male and female Swiss albino mice, weighing 22-30 g and age of 6-8 weeks, were used in the study. The mice were obtained from the animal house of the Department of Biology, College of Natural Sciences, AAU. The mice were housed in an air-conditioned room and were allowed to acclimatize for 1-week before the commencement of the study and were fed with standard commercial pellet food and tap water ad libitum. All procedures complied with the guide for the care and use of laboratory animals  and approved by the Institutional Review Board of the School of Pharmacy, AAU. Plasmodium berghei ANKA strain (chloroquine sensitive) was obtained from Department of Biology, College of Natural Sciences, AAU. It was subsequently maintained in the laboratory by serial blood passage from mouse to mouse on weekly bases. Latex was collected from the leaves of A. citrina by cutting and arranging the leaves concentrically around a depression in the soil, which was covered with a plastic sheet. It was then left in open air for 3 days to allow evaporation of water, which yielded a dark brown powder. The latex was dissolved in methanol and directly applied to preparative thin layer chromatography plates over silica gel using chloroform and methanol mixture (4:1) as a solvent system. Chromatograms were visualized under ultraviolet light at 254 and 366 nm. The antimalarial activity against P. berghei infection was evaluated using a 4-day suppressive standard test as described by Peter and Anatoli. Blood was taken from a donor mouse with rising parasitemia level of approximately 40% parasitized erythrocytes. The blood was then diluted with the normal saline medium and hence that each 0.2 ml contained approximately 10 7 infected red blood cells. Each Swiss albino mouse (male) weighed 22-30 g was infected with 0.2 ml (10 7 parasitized erythrocytes) P. berghei, which was expected to produce a steadily rising infection in mice. The infected mice were weighed and divided into five groups of 5 mice/group. Three test groups and two control groups (one for the vehicle that serves as a negative control and the other for the standard drug, chloroquine, which serves as a positive control) were used for each sample. The latex and isolated compound at doses of 100, 200 and 400 mg/kg of body weight per day, and the vehicle (0.5 ml distilled water) and the standard drug chloroquine at a dose of 25 mg/kg/day were prepared. Results of this study were expressed as mean ± standard error of mean (M ± SEM). Data were analyzed using windows SPSS version 20 (IBM Company). Comparison of parasitaemia among groups and statistical significance was determined using one-way ANOVA and Student's t-test at a 95% confidence interval (α =0.05). The results were considered significant when P < 0.05. According to Deharo et al.,  in vivo antiplasmodial activity can be classified as moderate, good, and very good if an extract displayed percent parasite suppression ≥50% at a dose of 500, 250 and 100 mg/kg body weight/day, respectively. Based on this classification the leaf latex of A. citrina can be considered as a good antiplasmodial agent. The activity of the latex may be due to the presence of anthrones, which are characteristic constituents of the genus Aloe. Thus, homonataloin A/B, which was isolated from the leaf latex of A. citrina was tested for its chemosuppression effects at doses of 100, 200 and 400 mg/kg/day. 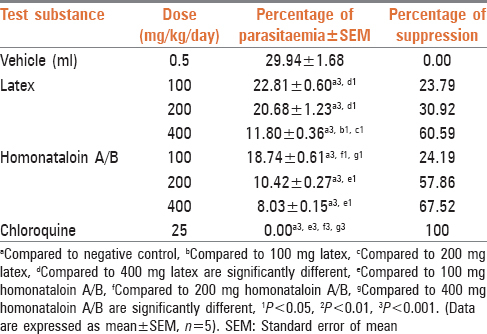 After a 4 days treatment with different doses of this compound, the mean parasitemia was lowered from 18.74 ± 0.61% to 8.03 ± 0.03% with maximum parasite suppression (67.52%) at a dose of 400 mg/kg/day [Table 2]. All groups of mice treated with homonataloin A/B showed significant reduction of parasitemia (P < 0.001) when compared to the negative control. These results indicated that the isolated compound possesses blood schizonticidal activity on early infection of mice with P. berghei. One of the effects of malaria is a reduction of body weight. In the present investigation, weight difference of the infected mice before and after administration of the latex of A. citrina was recorded. 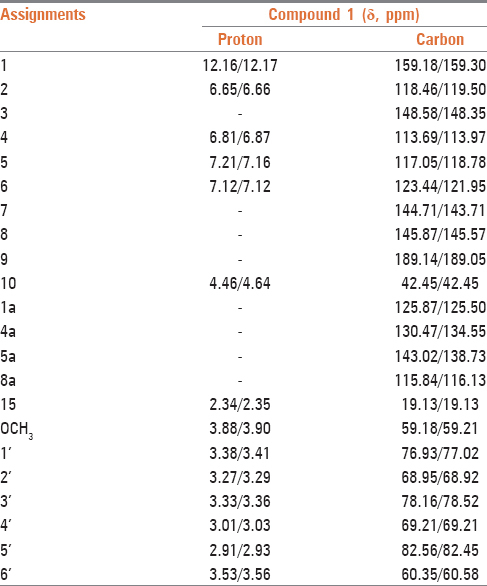 As shown in [Table 3], mice which received the vehicle (negative control) and treated with the latex with the exception of the group treated with 100 mg/kg of the compound, showed weight loss on the 5 th day of infection. The latter showed statistically significant (P < 0.05) improvement of weight when compared to the weight before treatment. However, mice treated with 25 mg/kg chloroquine showed significant (P < 0.01) weight gain and higher weight increment than those received 100 mg/kg of the latex. Animals treated with the latex decreased their weight with increasing dose implying the possible appetite suppressive effects of the latex. Similar results have been reported in the literature, , whereby the percent weight loss preventive effect of the butanol fraction of Asparagus africanus declined with increasing dose. 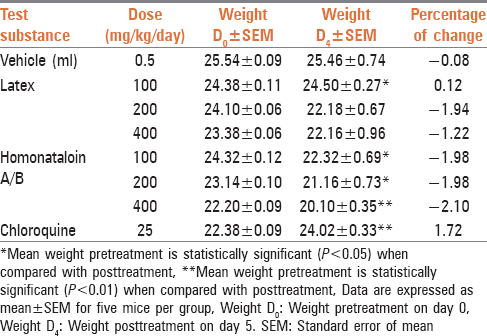 [Table 3] also depicts that mice treated with different doses of homonataloin A/B lost weight on the 5 th day of infection. The loss of weight was found to be dose-dependent with the maximum weight loss observed on animals treated with 400 mg/kg of the pure compound. In all compound and vehicle-treated groups the loss of weight was significant (P < 0.05). The loss of weight by homonataloin A/B treated mice could be attributed to the appetite suppressing effect of the compound as toxicity may be ruled out based on the results obtained from acute toxicity tests. Homonataloin A/B contains a chelating moiety (C-1 hydroxy-C-9 ketone combination), which is thought to be responsible for the antiplasmodial activity of potent compounds such as rufigallol. Therefore, the mechanism by which homonataloin A/B exerts its antimalarial action could be similar to that of rufigallol, which has been shown to involve chelation of iron, an essential element for cellular metabolism and DNA synthesis of the parasite. Results of this study confirm the genuine antiplasmodial activity of the latex of A. citrina, which has been shown to contain the anthrone, homonataloin A/B as a major constituent. The investigation also proved that the antimalarial activity of A. citrina could be attributed in part or in full to the presence of homonataloin A/B in the latex. Farooq U, Mahajan RC. Drug resistance in malaria. J Vector Borne Dis 2004;41:45-53. Pierre S, Toua VT, Fohouo TF, Nloga NA, Jean M. Medicinal plants used in traditional treatment of malaria in Cameroon. J Ecol Nat Environ 2011;3:104-17. Chenniappan K, Kadarkarai M. In vitro antimalarial activity of traditionally used Western Ghats plants from India and their interactions with chloroquine against chloroquine-resistant Plasmodium falciparum. Parasitol Res 2010;107:1351-64. Federal Democratic Republic of Ethiopia. Malaria Programme Performance Review, Ethiopia. Addis Ababa: Ministry of Health; 2012. World Health Organization. WHO Global Malaria Programme - World Malaria Report. Geneva: WHO Press; 2011. Mesfin A, Giday M, Animut A, Teklehaymanot T. Ethnobotanical study of antimalarial plants in Shinile District, Somali Region, Ethiopia, and in vivo evaluation of selected ones against Plasmodium berghei. J Ethnopharmacol 2012;139:221-7. Demissew S, Nordal I. Aloes and Lilies of Ethiopia and Eritrea. 2 nd ed. Addis Ababa: Shama Books; 2010. p. 42-57. Girma B. Anthrones Isolated from the Leaf Latex of Aloe citrina Carter and Brandham: Their Antimicrobial and Antimalarial Activities. M. Sc. Thesis. Addis Ababa University; 2013. Institute of Laboratory Animal Resources. Guide for the Care and Use of Laboratory Animals. 7 th ed. Washington, DC: National Academy Press; 1996. Camargo ME, Berdeja B, Miranda G. Diuretic effect of the aqueous extract of Bidens odorata in the rat. J Ethnopharmacol 2004;95:363-6. Peter IT, Anatoli VK. The current global malaria situation; Malaria Parasite Biology, Pathogenesis, and Protection. 1 st ed. Washington, DC: ASM Press; 1998. p. 11-22. Fidock DA, Rosenthal PJ, Croft SL, Brun R, Nwaka S. Antimalarial drug discovery: Efficacy models for compound screening. Nat Rev Drug Discov 2004;3:509-20. Arthi N, Murugan K. Antimalarial activity and phytochemical screening of ethanolic leaf extract of Phyllanthus niruri and Mimosa pudica. Int J Pharm Res Dev 2011;3:198-205. Conner JM, Gray AI, Reynold T, Waterman PG. Anthrone and chromone components of Aloe cremnophila and A. jacksonii leaf exudates. Phytochemistry 1990;29:941-4. Deressa T, Mekonnen Y, Animut A. In vivo anti-malarial activities of Clerodendrum myricoides, Dodonaea angustifolia and Aloe debrana against Plasmodium berghei. Ethiop J Health Dev 2010;24:25-9. Paulos B, Bisrat D, Gedif T, Asres K. Antimalarial and Antioxidant activities of the leaf exudates and a naphthalene derivative from Aloe otallensis Baker. Ethiop Pharm J 2011;29:100-7. Deharo E, Bourdy G, Quenevo C, Muñoz V, Ruiz G, Sauvain M. A search for natural bioactive compounds in Bolivia through a multidisciplinary approach. Part V. Evaluation of the antimalarial activity of plants used by the Tacana Indians. J Ethnopharmacol 2001;77:91-8. Dagne E, Bisrat D, Viljoen A, Van Wyk B. Chemistry of Aloe species. Curr Org Chem 2000;4:1055-78. Nogueira CR, Lopes LM. Antiplasmodial natural products. Molecules 2011;16:2146-90. Endale M, Ekberg A, Alao JP, Akala HM, Ndakala A, Sunnerhagen P, et al. Anthraquinones of the roots of Pentas micrantha. Molecules 2012;18:311-21. Osman CP, Ismail NH, Ahmad R, Ahmat N, Awang K, Jaafar FM. 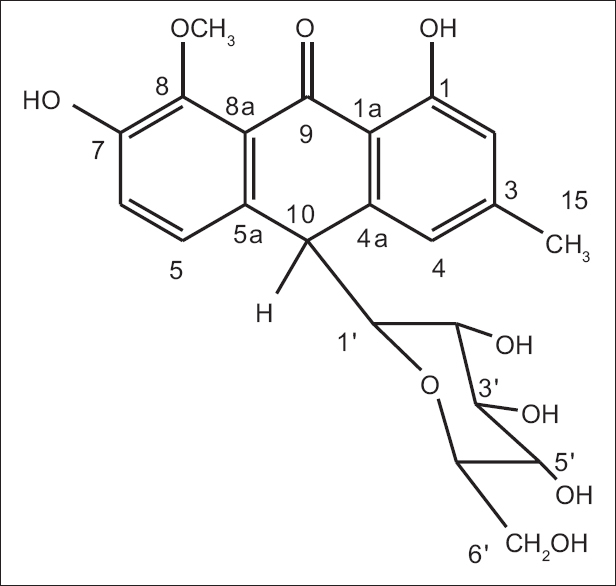 Anthraquinones with antiplasmodial activity from the roots of Rennellia elliptica Korth. (Rubiaceae). Molecules 2010;15:7218-26. Wube AA, Bucar F, Asres K, Gibbons S, Rattray L, Croft SL. Antimalarial compounds from Kniphofia foliosa roots. Phytother Res 2005;19:472-6. Dikasso D, Makonnen E, Debella A, Abebe D, Urga K, Makonnen W, et al. In vivo antimalarial activity of hydroalcoholic extracts from Asparagus africanus Lam. in mice infected with Plasmodium berghei. Ethiop J Health Dev 2006;20:112-8. Yared D, Mekonnen Y, Debella A. In vivo antimalarial activities of fractionated extracts of Asparagus africanus in mice infected with Plasmodium Berghei. Phol 2012;3:88-94. Winter RW, Cornell KA, Johnson LL, Isabelle LM, Hinrichs DJ, Riscoe MK. Hydroxy-anthraquinones as antimalarial agents. Bioorg Med Chem Lett 1995;5:1927-32.